RTW, COR, NSSN: fight for anti-cuts unity! 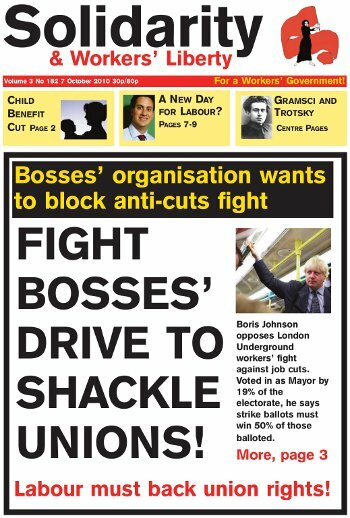 Firefighters: "Cuts will affect public safety"
Fight bosses' drive to shackle the unions! Revolution In the Labour Party? What's New In Ed Miliband's Party? Media announce "death of New Labour"
Tubeworker is a rank-and-file bulletin produced by worker-activists on London Underground. It is the only consistently-produced bulletin of its type and was founded for Workers' Liberty members working on the Underground 20 years ago. AWL continues to be centrally involved but the bulletin is also supported by a range of activists who are not AWL members. The BNP’s internal difficulties continue; they are in debt and have expelled their London Assembly member Richard Barnbrook. However, their “tabletop” campaign is giving them new life at the grassroots. The “Coalition of Resistance” (initiated by Counterfire, a group of people who recently left the SWP) has called an anti-cuts conference on 27 November. “Right to Work”, a campaign initiated and run by the SWP, has called a “unity conference” for anti-cuts activists on 5 December. And the National Shop Stewards’ Network, mostly run by the Socialist Party, has set an anti-cuts conference for 22 January. Winter’s Bone is a thriller: a detective story in which a girl must find her drug-dealer father to prevent the repossession of her family home to pay his bond. Were it set in some urban future dystopia and populated by gun-toting pneumatic blondes, it would be heralded, like Sin City, for its noir echoes. Following a wave of textile strikes in Bangladesh, a reviving workers’ movement is facing savage repression in Bangladesh.The campaign in solidarity with victimised strikers and activists continues. The following is an extract from an article on the US SocialistWorker.org website. Following the attempted coup by a section of the police against the government of Rafael Correa in Ecuador, the Mexican section of the United Secretariat of the Fourth International (the Workers Revolutionary Party — PRT in Spanish) issued a statement of opposition through the FI’s International Viewpoint. The Bonapartist regime of Hugo Chávez suffered a setback in the Venezuelan elections on 26 September, winning a majority of parliamentary seats but not the two-thirds majority it wanted in order to make further constitutional changes. The ruling party, Chávez’s PSUV, gained 98 of the 165 seats available in the national assembly.